Pender County Schools has joined forces with Pender County Library to provide all Pender County Schools students with free access to digital resources from the Library! We share the belief that a love of reading and learning is a strong foundation for student success, and it is with these shared goals in mind that we are working together to ensure that every PCS student will have access to e-books and other digital resources available through the public library. Through this partnership, PCS students will be able to access e-books, downloadable audiobooks, online tutors, and more! All students will need is their school username and a password that will be provided to them by their homeroom teacher. We are calling this initiative Library Bridge. What can students get with a Library Bridge account? Pender County Library offers many digital resources that can be found on our Digital Resources page. Students using their Library Bridge accounts can use almost all of these digital resources. * E-books, audiobooks, online tutors, and other digital library resources are accessible on most smartphones and tablets, including Apple, Android, and Windows devices, as well as Chromebooks. 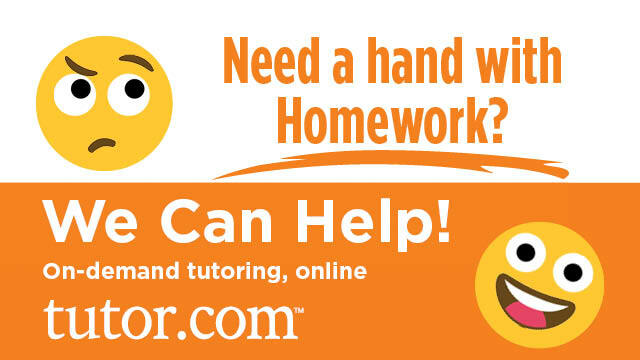 There are two services that we think will be especially useful for students: on-demand online tutoring through Tutor.com, and e-books from our two digital libraries, NC Kids and E-iNC.
Students will have access to online, on-demand tutoring through Tutor.com from 2 pm to 9 pm every day, including weekends, and can drop off papers and math problems for feedback 24 hours a day with a guaranteed response within 24 hours. E-books, audiobooks, and videos for children from pre-K to 3rd grade, as well as over 1,000 titles for kids and tweens grades 4-8. E-books, audiobooks, and streaming video for kids of all ages as well as teens. Who can get a Library Bridge account? All Pender County Schools students are automatically enrolled in this program. The student accounts are free, and there are no overdue fines for any of the library resources available with these accounts. When the loan period ends, the e-book or audiobook is automatically returned. Students will access resources using their school username and a password that will be provided to them by their homeroom teacher.